Kaiba is rich. Uncle Scrooge from Duck Tales rich. He manages his own accounts, rides limos everywhere, and has an unlimited passion for Magic & Wizards/Duel Monsters. He even created the ultimate gaming place, "Kaiba Land". He can't live with the fact that Yugi beat him, but he realizes that Yugi changes when he starts to play a game. He also knows that Yugi's pendent is the key to his transformation. However, if you take away the pendent Yugi is still capable of transforming into the game master. His ultimate goal in life is to beat Yugi using whatever means necessary. Seto has a younger brother named Mokuba. Mokuba shares the passion of gaming, and wants to see Yugi humiliated for messing with his brother. Since both parents died, and both were sent to an orphanage, Seto promised Mokuba that he would take care of them no matter what. Seto challenged the president of the Kaiba Corporation, Gozaburo Kaiba, to a game of chess when he came to the orphanage to adopt. As a reward for the game, Seto and Mokuba became his adopted sons. However, Gozaburo treated Seto cruelly to train his successor. That is why Seto is so cold-hearted. Even though Kaiba is the wealthy CEO of his own multinational high-tech corporation, KaibaCorp, his real passions lay in the world of Duel Monsters. There, he uses his ruthless business drive to overcome any who challenge him. 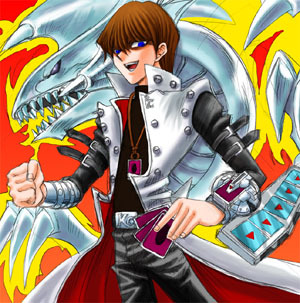 He is an expert in the art of dueling and although he resents him, Kaiba is slowly developing respect for Yugi. We may see Kaiba straying from his selfish ways just yet!